The Rep stages Jane Austen's classic; eloquence and humor yes, passion no. Kate Hurster, Laura Gordon and Victoria Mack in the Milwaukee Repertory Theater’s Quadracci Powerhouse production of “Sense and Sensibility.” Photo by Michael Brosilow. Shame on me, I know. I have never read Jane Austen’s Sense and Sensibility. Wuthering Heights was my required English lady-author-classic in high school. I’ve filled my Austen quota by watching Joe Wright’s Pride & Prejudice (“the Keira Knightley version”) approximately a million times. To be honest, it all reads about the same to me, including last night’s opening of Sense and Sensibility at the Rep. The production is lovely. Talented actors move seamlessly from role to role, sometimes within seconds. 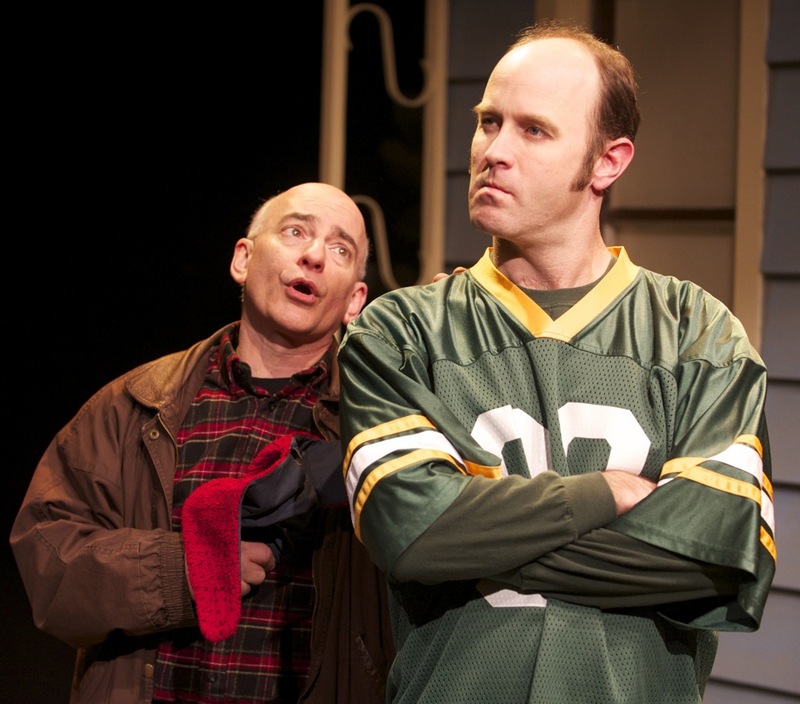 In Mark Healy’s adaptation and under Art Manke’s direction, the play moved well and at times made me laugh. But it didn’t affect me. The characters failed to wrench my heart, despite all the opportunity to feel empathy toward Elinor and Marianne Dashwood. Sense and Sensibility is a nice play. No more, no less. I’m sure you know the story: Mr. Dashwood dies, leaving his only son John (John-Patrick Driscoll) vague instructions to take care of his mother and two sisters. Enter John’s wife, Fanny Ferrars (Meaghan Sullivan), who convinces her husband that his sisters and mother will be fine with nothing. Mack, in the Milwaukee Rep’s rain, in “Sense and Sensibility.” Photo by Michael Brosilow. Mrs. Dashwood (Laura Gordon), Elinor (Kate Hurster) and Marianne (Victoria Mack) fortunately find a place to stay with Mrs. Dashwood’s cousin, Sir John Middleton (Jonathan Gillard Daly), at Barton Park. They live in the cottage house, a downgrade from their home in Norland. And here is where the love story begins, as young Marianne injures her ankle while dancing in the rain. (It actually rains on the set! Neat!) Handsome Willoughby (Ben Jacoby) just happens to be walking by in time for a rescue. The two begin a quick courtship. Marianne shows her youth and naiveté as she describes her vision of marriage to her sister. She wishes to have in common with her match every single taste and for love to prevail above all. We also know that though she won’t admit it, Elinor is smitten with Edward Ferrars (Nick Gabriel), Fanny’s older brother. He is a safe and slightly dull bet. But where Marianne relies on her sensibility, Elinor prefers sense. At the end of Act I, Lucy Steele (Sullivan in a second role) is introduced as a distant cousin to Elinor and Marianne. She pulls Elinor aside to reveal her four-year secret engagement with Edward. At the start of Act II, the sisters have moved for a time to London. Marianne is eager to reunite with Willoughby there, while Elinor is quietly heartbroken by Lucy’s claim on Edward. Willoughby turns out to be a jerk, rejects Marianne through a letter, and Marianne falls into a deep depression. At the Rep, great comic performances surround the sisters as they mourn their love lives. Mrs. Jennings (Laura Gordon in a second role), mother of Lady Middleton, is a booming, gossipy, often tipsy treat. Nick Gabriel performs his second role, Robert Ferrars, a flamboyant character whose mere facial expressions caused the audience to erupt in laughter. However, Act II also sees a lot of exposition. Colonel Brandon (Driscoll in a second role) appeared earlier at Barton Park, and it was made clear that he was drawn to young Marianne. He comes to explain his past to Elinor—the loss of his first love Eliza, and his acquisition of her young daughter. We also hear from Elinor for the first time about her true feelings. Marianne has hogged the depression spotlight, but Elinor explains that, actually, she’s been sad, too, for four months. Of course, this is Austen, so the language is not so brief or casual. Willoughby offers his own monologue as he visits the sisters in Colonel Brandon’s home after they leave London in a hurry. Marianne has fallen very ill with an “infection” (perhaps of the heart? ), and while Elinor won’t allow him to see her, she listens to his flimsy explanation about deserting Marianne because she’s not rich. Things wrap up pretty quickly. A cured Marianne begins a courtship with Colonel Brandon. Lucy ends up with Robert Ferrars, so Edward is free to ask Elinor to marry him. The sisters are exceedingly happy in the end because, of course, they’re getting married. I’m tempted to insert a 21st century argument: It seems antiquated and silly that the Dashwood sisters are super depressed through most of the play, based on the way a few stupid boys treat them. Can’t they have fun with each other? Perhaps befriend Lucy Steele? Romp around London, which they’re visiting for the first time? Find happiness outside of marriage? But I get it; this is the way things were. And it was nice for a night to hear that Austen language, of long, pretty sentences that convey ideas so thoroughly and elegantly — but falls short of passion. Sense and Sensibility runs through Jan. 13 at the Milwaukee Repertory Theatre. See the full schedule and purchase tickets online, or call 414 224-9490. The cast of Sense and Sensibility in Milwaukee Repertory Theater’s 2012/13 Quadracci Powerhouse production of “Sense and Sensibility.” Photo by Michael Brosilow. You really do need to read the novel. You really do. So much of the back-story is, necessarily, left out of any stage version, or changed utterly. (You need to read “Pride and Prejudice” too. The Kiera Knightley version is not very faithful to the book at all.) No reviewer who is not conversant with the classic novel upon which a stage play is based should be permitted to review it. Truly. You miss too much. I disagree. I think that anyone who has read the book may turn a review of the stage adaptation into a compare/contrast project. I enjoy coming into the theater with little back story to guide my experience. I agree that it’s an important classic, and I should read it, but I also believe this has little or nothing to do with my “permission” to review the play. Better late than never. Read the book now. Yes,it’s possible to review an adaptation of a book–you just did– but what you say would be much more compelling if you’d read the book. Some books have a lot of action and can be more easily turned into a play or movie than Jane Austen’s works. I think if you read the book you’ll see what it really is about, and what these “silly girls” really had to deal with. Why you watched the Keira Knightley fiasco so many times boggles my mind. Let’s put it this way: Jane Austen is not particularly dramatic, and you have to read the books to experience her thoughtfulness and expressiveness. In S&S she is contrasting the cult of sensibility, which we might call sensitivity, with self control. She sees problems with both. ; and she introduces a dkerar tone near the end. Still, there’s a slight humorous tinge to her writing, especially when she’s gently mocking Marianne and Mrs. Dashwood’s melodrama ( They gave themselves up wholly to their sorrow, seeking increase of wretchedness in every reflection that could afford it ). And Marianne and Elinor make excellent dual heroines for this book that still love and cherish each other, even though their polar opposite personalities frequently clash. What’s more, they each have to become more like the other before they can find happiness. There’s also a small but solid supporting cast the hunting-obsessed Sir John, the charming Willoughby (who has some nasty stuff in his past), the emotional Mrs. Dashwood, and the gentle, quiet Colonel Brandon, who shows his love for Marianne in a thousand small ways. Sense and Sensibility is an emotionally powerful, beautifully written tale about two very different sisters, and the rocky road to finding a lasting love. Not as striking as Pride and Prejudice, but still a deserving classic.